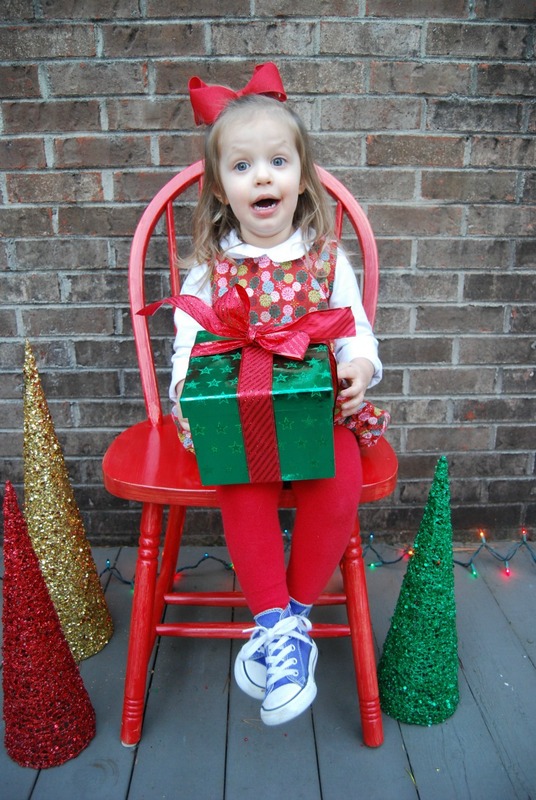 I decided to take Christmas card photos of Jane again this year. Last year's are still some of my favorites. 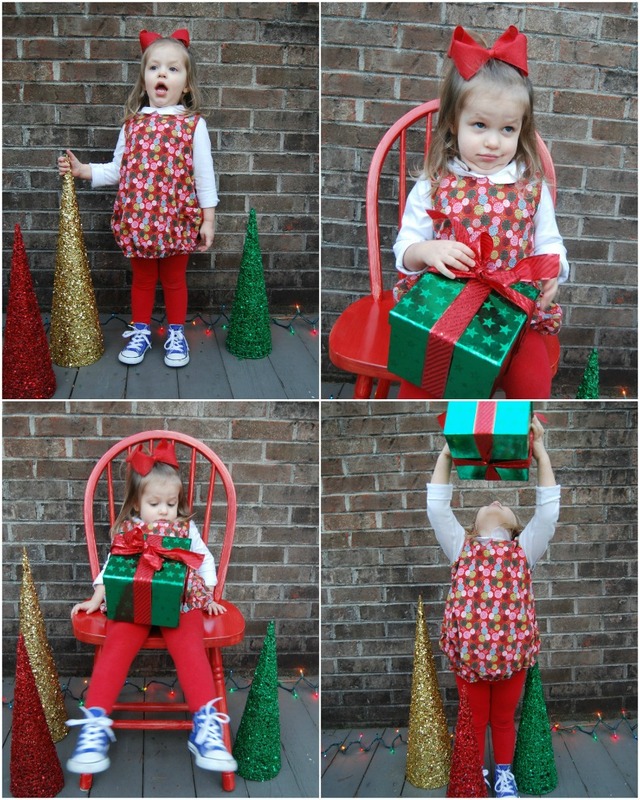 So I set up a cute little vignette on the back porch and dressed Jane in her Christmas jumper I made last month. And this is what I got. Oh, two year olds (going on threenagers). They are so wonderfully cooperative, aren't they?? I bribed with everything I had. But no such luck. If you could have been a fly on the wall while I was attempting my photo shoot. Most of the photos are blurry like this. Never stops moving. I hope these photos make you laugh as hard as I did as I was going through them. I took 248 photos trying to get a sweet one. And I got one sweet one. One. 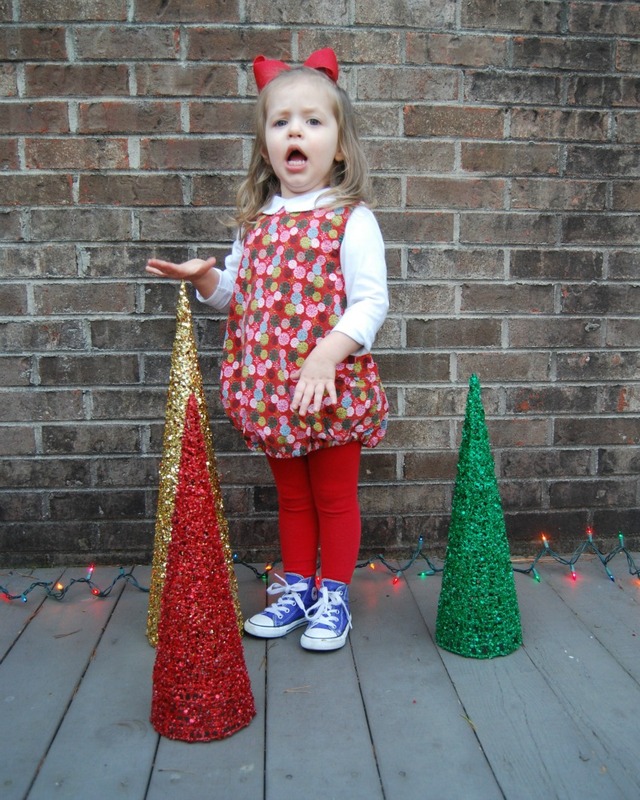 So we put the sweet one on the front of our Christmas card this year and a bunch of the hilarious ones on the back. She's a trip, y'all. And now a quick pattern review of the corduroy jumper I sewed (jumper in the American sense of the word!). 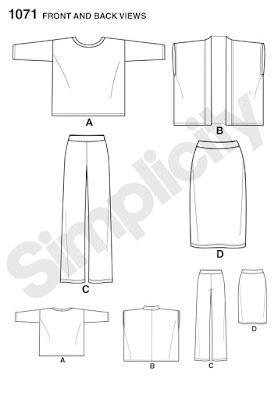 Pattern Description: A Burda envelope pattern, 9447. 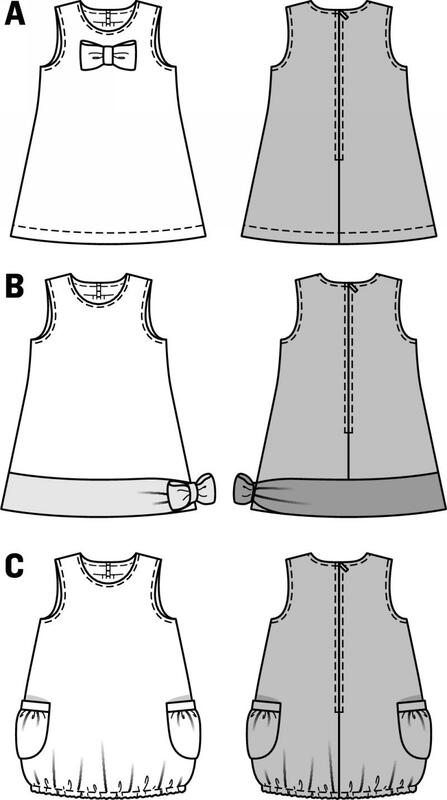 Three sleeveless dresses with different trim options- bows and hem bands. I made view C which has a really cute bubble shape with elastic in the hem and gathered patch pockets. Jane loves the pockets, which you can't see very well in this fabric. Every time she has worn it, she packs them full of little toys. 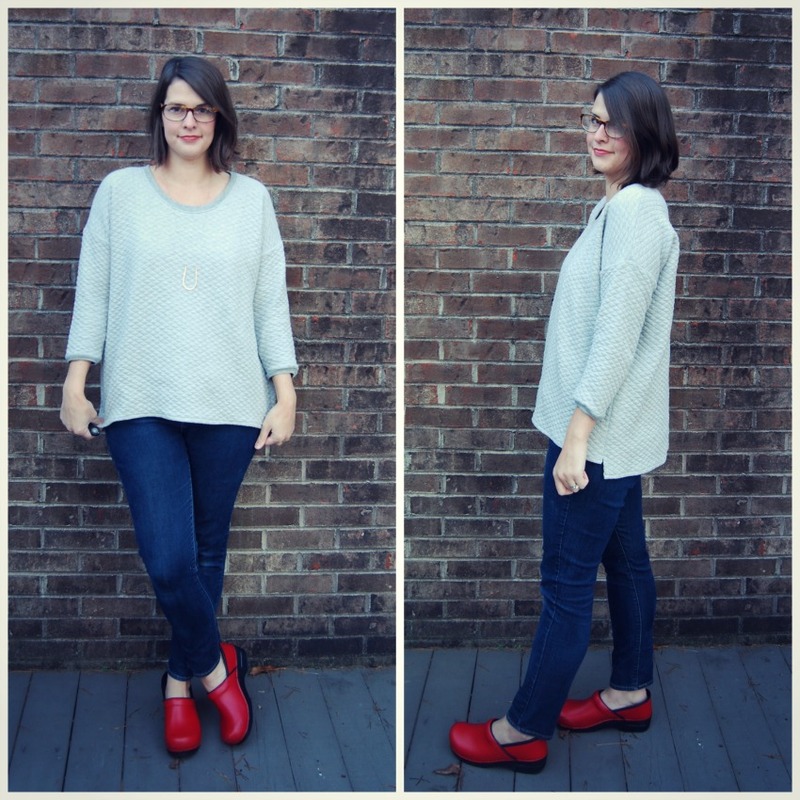 Pattern Sizing: US sizes 2-7. I made Jane a size 2 even though she is really wearing a 3T in rtw. I think I probably could have made her a size 3 in this pattern although the shoulder fit is perfect. It's the tiniest bit short on her but she's tall. Fabric Used: A very lightweight printed corduroy from fabric.com. The fabric is adorable and I bought one yard a few months ago with the intention of making Jane something for Christmas. It was easy to sew. Alterations/Deviations: I omitted the zipper at the back and did a keyhole closure instead. Way easier than putting in a zipper. But her hair does get caught in the button. Maybe I need a different button? Likes/Dislikes: I really love everything about it. And Jane likes it, too, but just because of those pockets. I spent some time sewing those pockets. Probably more time sewing the pockets than the rest of the dress. The elastic in the hem is what makes the dress so adorable. She has worn it quite a few times since I made it already. I sewed it all in one day right before her picture day at school. 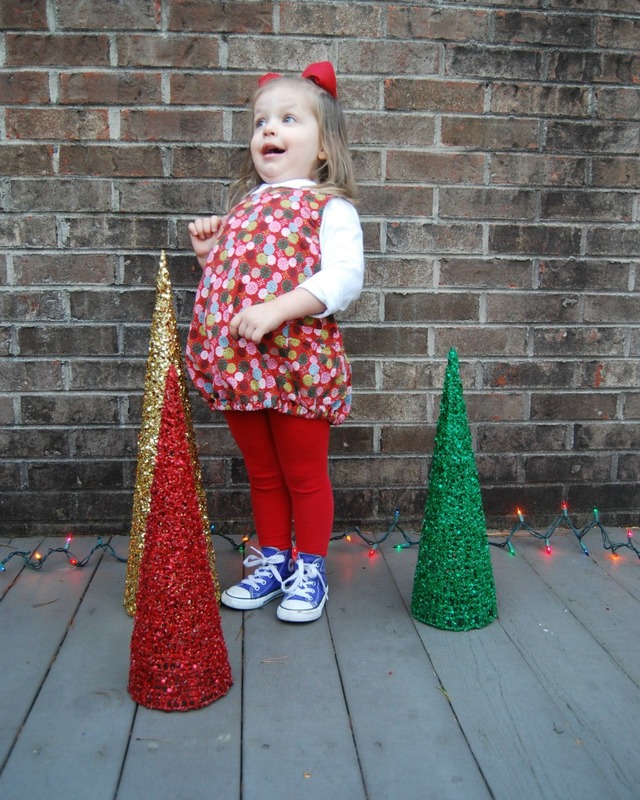 Conclusion: Cute little dress for a preschooler. I'm filing this pattern away for summer. I can see making it again, for sure. This might be the most ridiculous thing I've made. 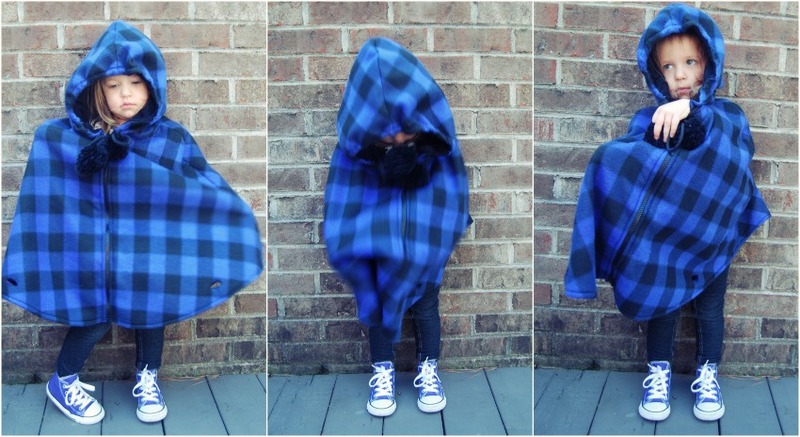 A sweatshirt cape. This all started when I made that cape for Jane (that she hates). I really wanted one in my size. My original plan was just to make something super simple like Jane's. But then it morphed in to something more elaborate. So now I have a fully lined, hooded cape complete with toggles and a zipper. But still all in a sweatshirt knit! Like I said, it's kind of ridiculous but I really like it. There are some major flaws, of course. Mainly because I sort of made things up when I got to the closures. But I'm trying not to be bothered by them. And sweatshirt knit is not exactly the right sort of fabric for outerwear like this. But I think it works. Pattern Description: New Look 6073. 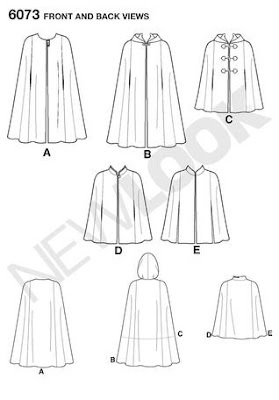 Misses cape in two lengths with different closure variations. Adding toggles are actually in the pattern instructions but the zipper and zipper shield are not. I made them up at the last minute. I've never used a New Look pattern before but this one looked like it had everything I needed and was simple. It seems to be an old pattern and there are quite a few reviews online, which is always helpful. 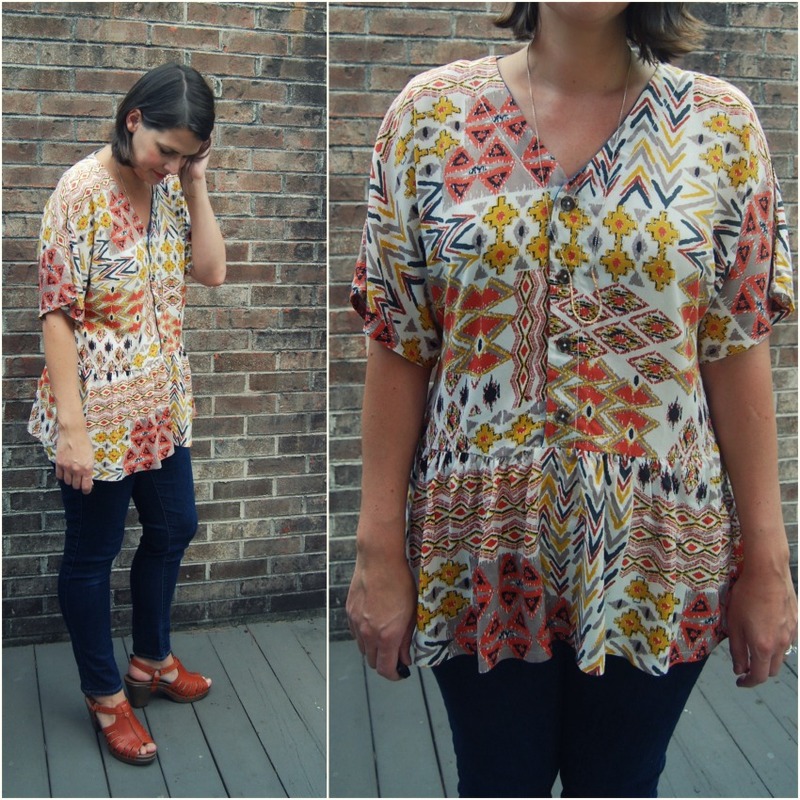 Pattern Sizing: XS-XL. I made a small which is a size below my measurements on the size chart. I sized down after reading reviews that it runs big. The size small definitely does not feel big on me and I can't imagine that the M would be much bigger. I probably could have made a M and been fine. Fabric Used: Sweatshirt fleece for the outer fabric and some sort of mystery knit for the lining. The mystery knit is one of those that's fused to some sort of backing. It's all polyester. I found it at Joann's. I originally wasn't going to line this so I could enjoy the fuzzy side of my sweatshirt fleece. But after sewing together the shell I decided it needed more weight. So I went out in search of lining. On a side note, in the photo above you can see I shortened one of my tops from my last post and I think it looks so much better. 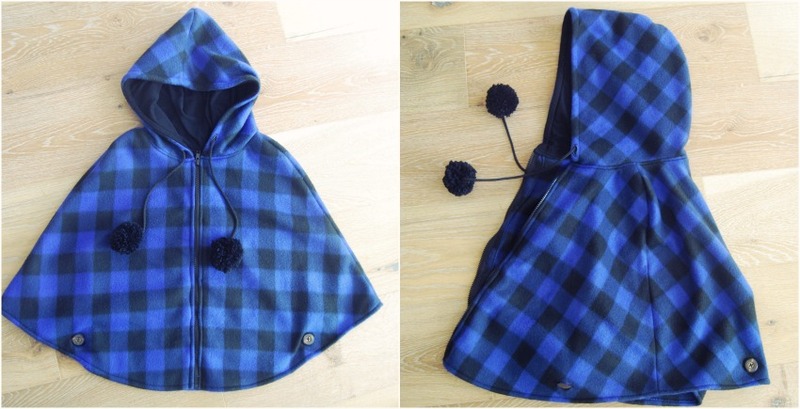 Alterations/Deviations: From the reviews (and pattern piece) I could see that the hood was huge. Like crazy costume-y huge. I folded out a four inch horizontal tuck to get rid of some of the enormousness. I kept all the width, though because I didn't want to mess with the neckline seam. I think it made the hood a much more reasonable size. Can you imagine four more inches of height on that hood? Other than that, I didn't make any other changes except for the closures. One pattern reviewer noted that the curve of the shoulder seam is pretty drastic and I agree. But I think it sits on my broad shoulders just right. 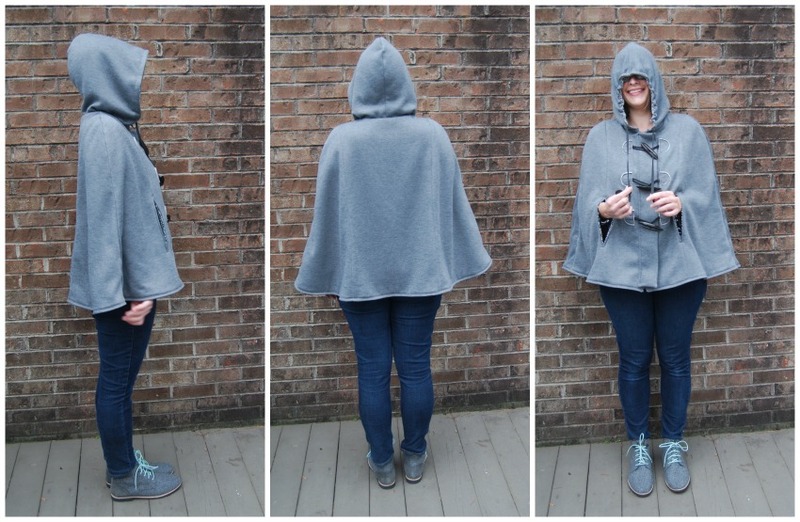 Oh, and I put a drawstring in the hood like I did on Jane's cape. I thought it would help me cinch in the hood in case it was still too big. The closures are where I sort of made it up. I wasn't originally going to add toggles. I was just going to do a zipper. But after seeing toggles in the instructions I decided I wanted both. I sewed the zipper in between the shell and lining, which was easy to do. But after sewing in the zipper I decided that I needed a zipper shield. Actually, I'm not sure if I should call it a shield since it's on top of the zipper and not underneath it. Anyway, I wanted a flap over the zipper. I added it on after the fact and that is why my toggles aren't centered. There wasn't any way to center them afterwards. So you'll notice my toggles are closer to one princess seam on one side. Ah well. If I had thought it through, I would have made one front piece wider than the other to compensate. Hopefully it's not too obvious. I ended up stitching on my toggle patches with a straight stitch and leaving the edge raw. I like the way it looks except I didn't trim my interfacing on the patches smaller and now you can see the edges of the interfacing, too. I may go in and trim it down but I think I might see how it washes first. You can still see my red marking pencil in this photo. Hope that washes out, too. I found the cord at the fabric store and had the toggles in my stash. I think my cord should be tiny bit shorter so the toggles close tighter, but it's close enough. Likes/Dislikes: It's definitely something different. I think I'll wear it on the weekends when I don't need to use my arms much. Ha! You can see me illustrate below how useless the arm slits are. Not a lot of mobility in a cape but they are fun to wear. It's actually pretty warm, too, with the two layers of heavy knit. I didn't want to stitch the hem but I had to. The lining is stitched all the way around and there was no way to get any sort of crisp hem in sweatshirt fabric. So I top stitched around the bottom with a zig zag stitch. It's alright. 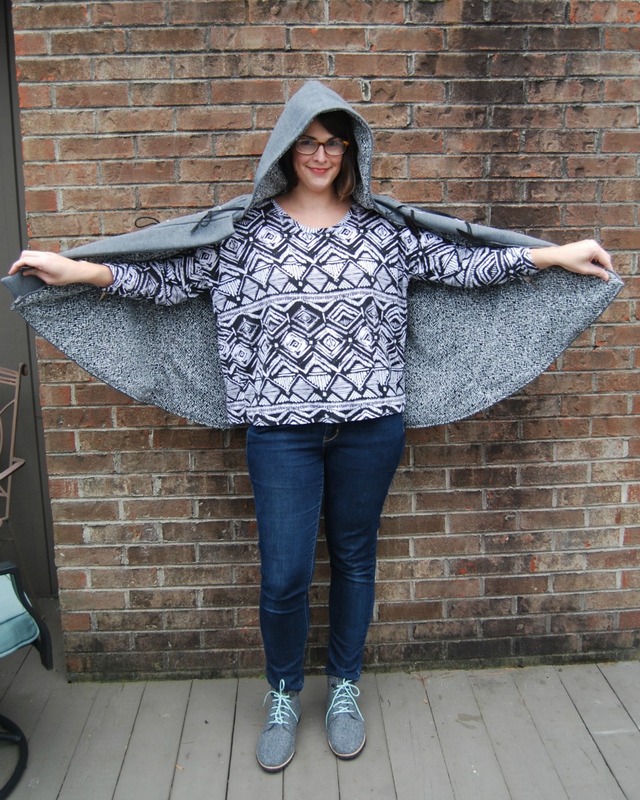 Conclusion: I can't see myself making another cape any time soon, but if I did I wouldn't hesitate to use the same pattern. It would be even nicer in a proper coating fabric. I am a little embarrassed that I am even writing this blog post. Actually, not that I'm writing this blog post, but that I actually took pictures of all of these this afternoon. Prepared to be amazed! I made a bunch of slouchy tees again. This time I used Simplicity 1071 and I believe it deserves mention because it is a great and easy pattern. Which is really why I'm writing this post. 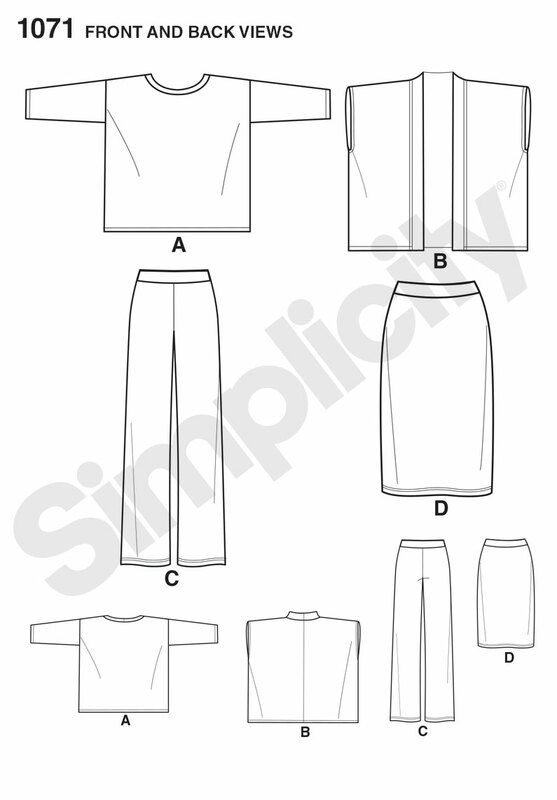 Pattern Description: The pattern is an easy to sew sportswear pattern. I made the top, obviously. I'm kind of intrigued by the vest/cardigan. The top really is just a bunch of rectangles with maybe a little shaping at the sleeve. 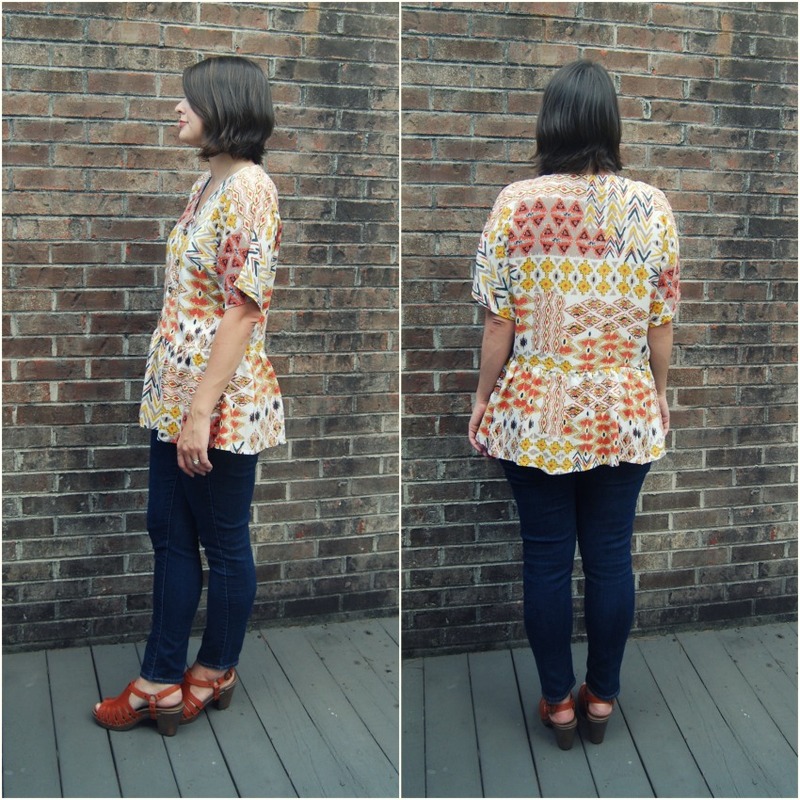 I haven't sewn Grainline's Hemlock tee, but it looks just the same to me. I know that the Hemlock tee is free, but I have come to the realization that I absolutely loathe taping together pdf patterns. Nothing will stop me from sewing faster than having to tape a pdf together. I think that's also another reason I use a lot of Big 4 patterns. And they are cheap and readily available where I am. 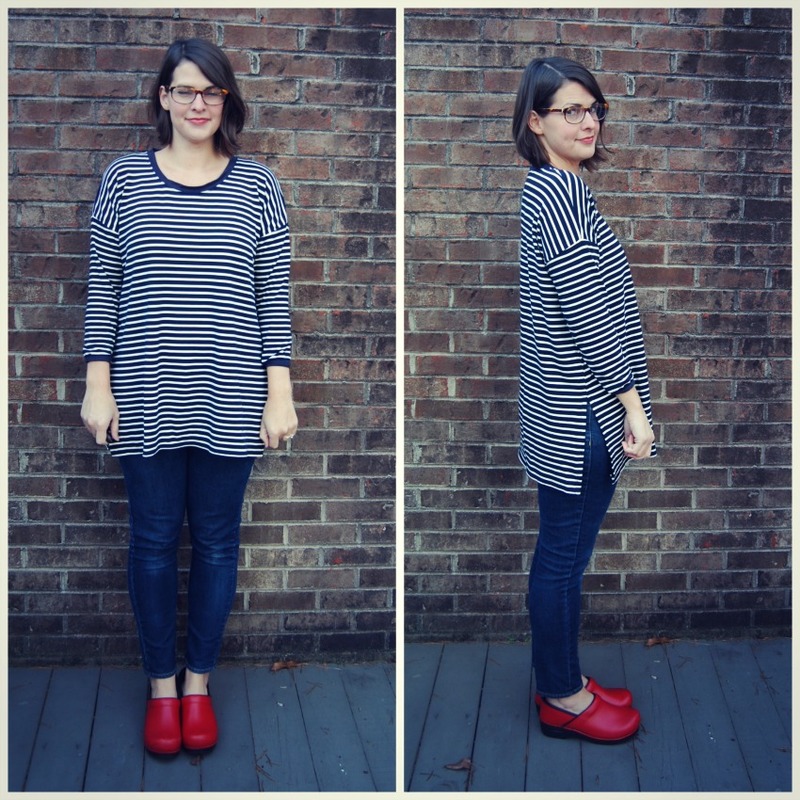 Pattern Sizing: XXS- XXL. Big size range. I made a small. My bust measurement is actually in between a small and medium. Not that sizing is a big issue with this pattern. Fabric Used: Lots of different knits! 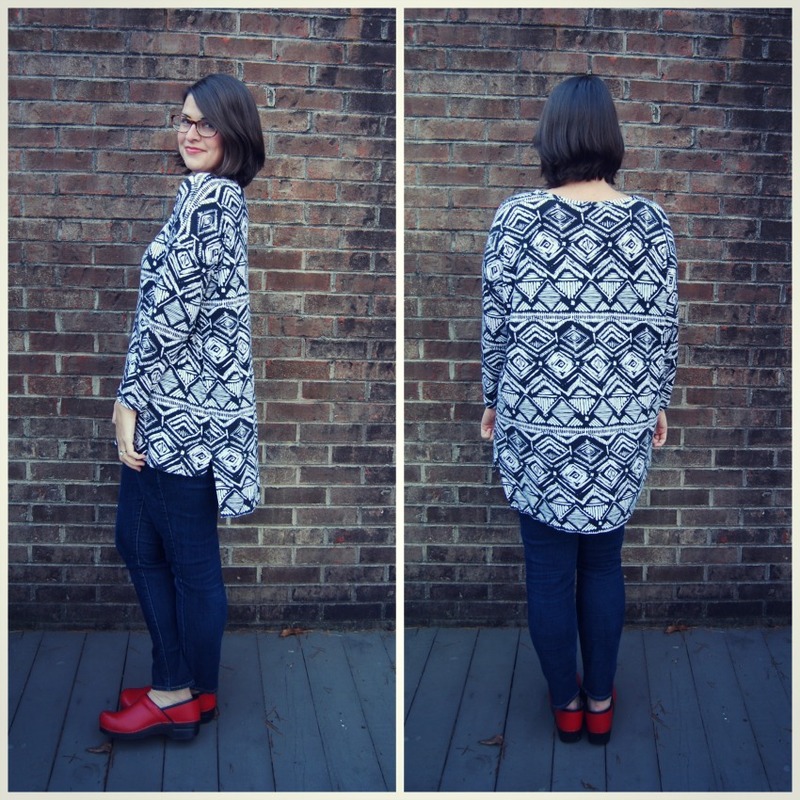 My first black and white (super long) version was done in a super cheap rayon knit. 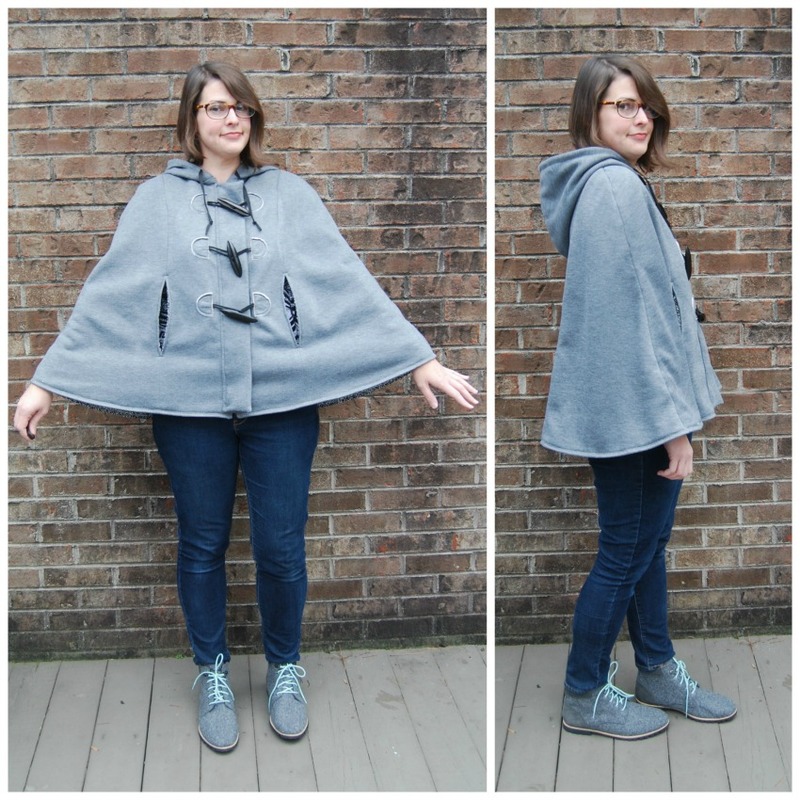 Next, I used a grey quilted sweatshirt knit that I found at Joann's, believe it or not. It actually has batting quilted in between layers so it's warm. 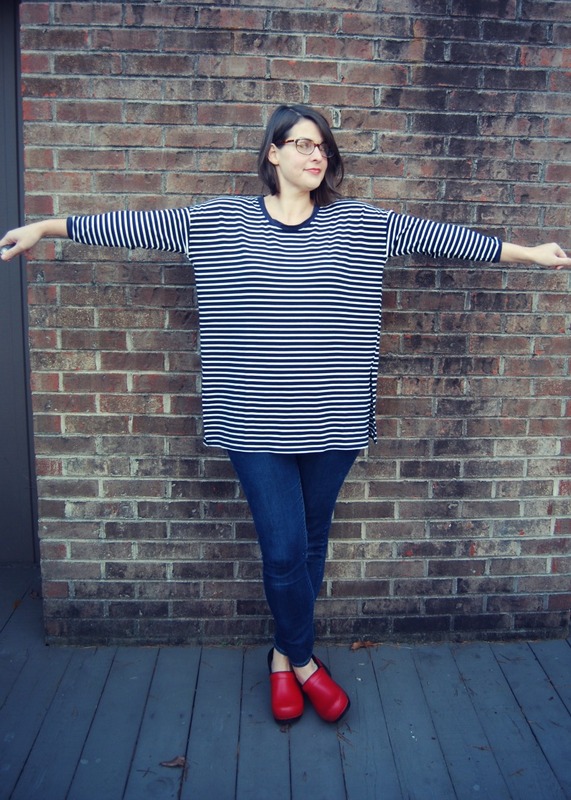 The grey and black striped version is a cotton/spandex knit that wrinkles like crazy. The pea green version is a silky bamboo knit. And the navy stripe is a heavy ponte knit. Alterations/Deviations: I changed the length on almost every version, adding length. 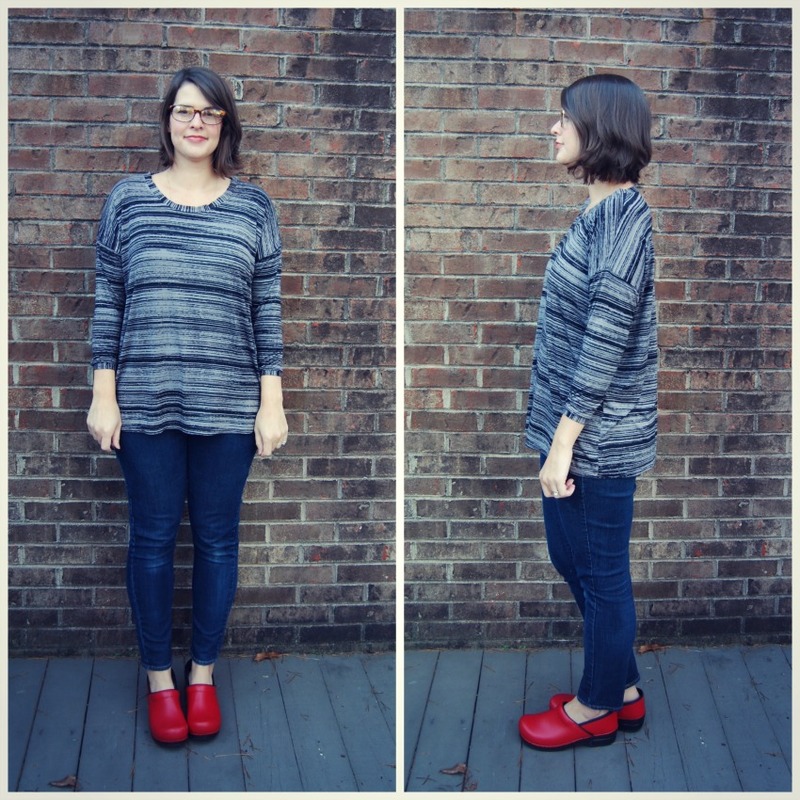 The only version that is close to the original hem length of the pattern is the grey and black striped tee. I only added two inches to that one. I wanted all of these to be super long and slouchy. However, after looking at photos I realize that these are not the most flattering tees I own. That's ok. They are not supposed to be. I may shorten the black and white printed version, though. Or at least get rid of the longer back. I also added side seam splits to several versions just because it seemed appropriate. The navy striped version has extra deep side splits and I like them a lot. 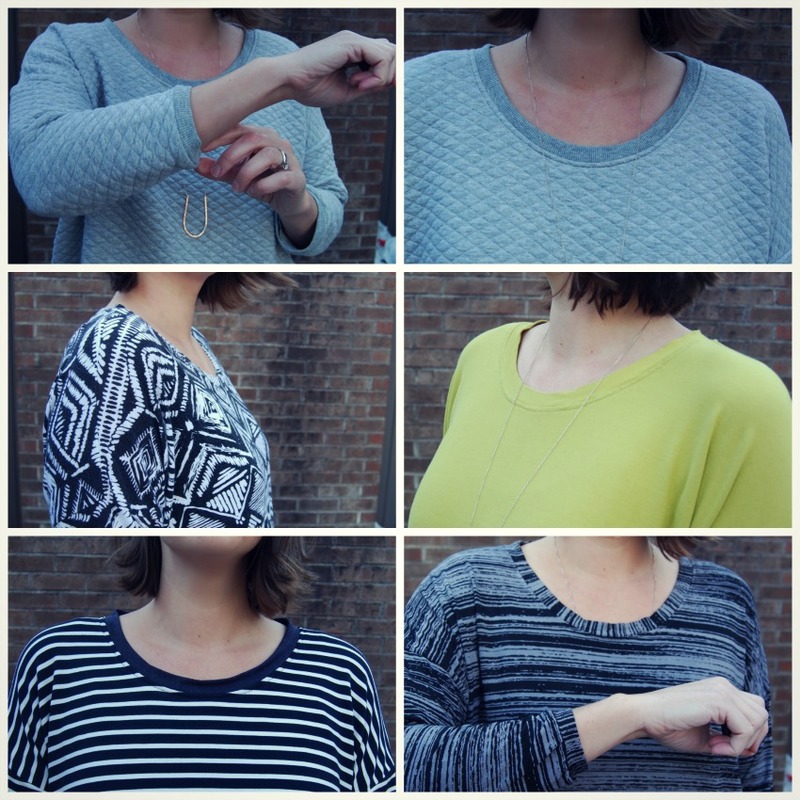 Here's a photo of all the different neckbands. I used self fabric for most, but used a grey rib knit for the quilted version and a navy jersey for the ponte version. It was good practice to do all these neckbands in different knits. 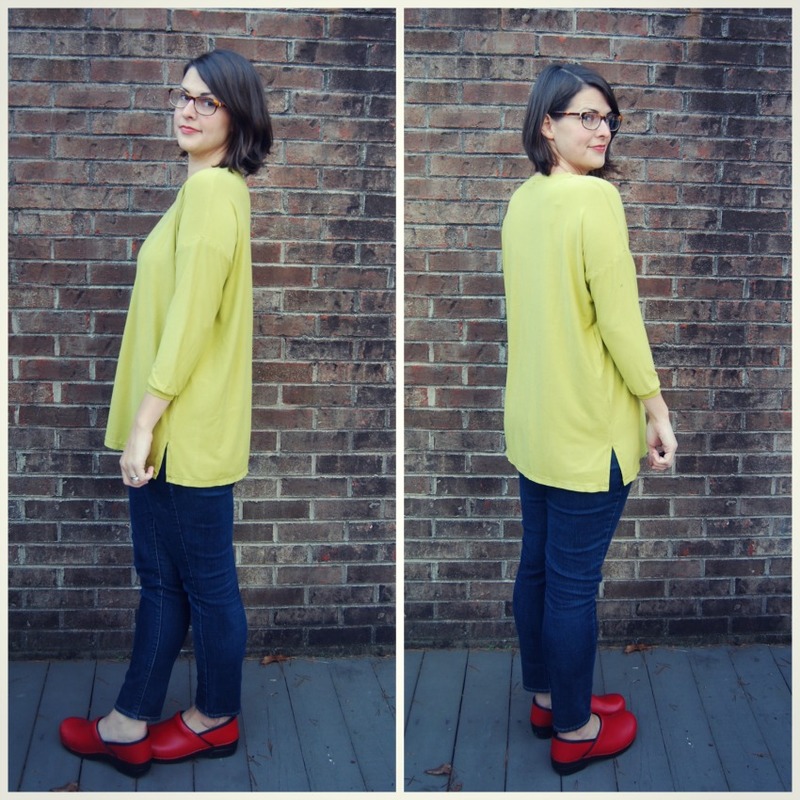 The rayon jersey and bamboo seemed to work the best and lay the flattest. The navy jersey with the ponte knit is all sorts of wavy. The grey and black version is not the best either since I cut on the cross grain. There! At last. 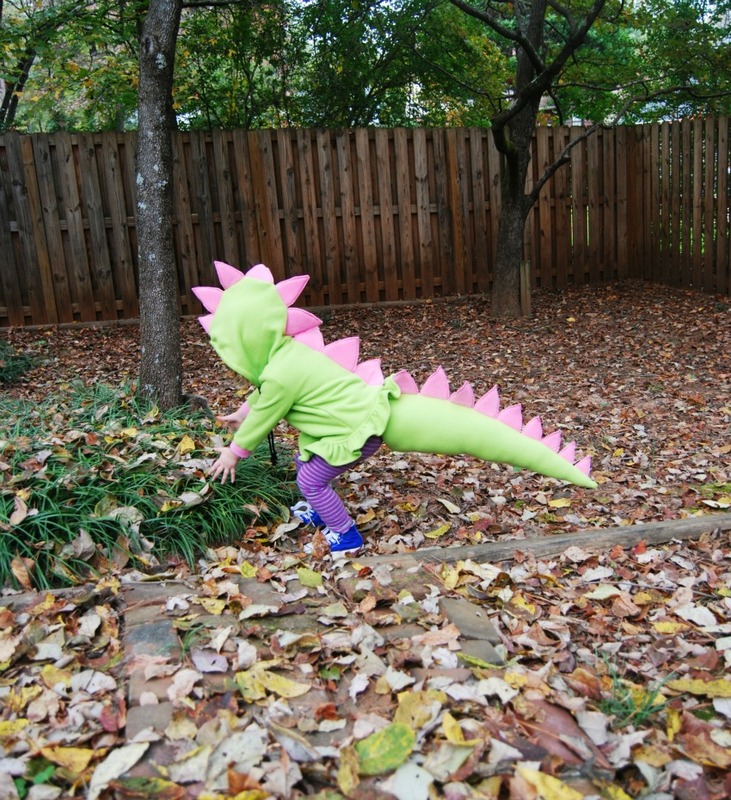 My patience was rewarded as the elusive Toddlersaurus Rex entered the clearing, seemingly unaware of my presence. I held my breath, careful not to make a sound and scare her away. She was a beauty! SNAP! I stepped on a branch and surprised her. She was startled! 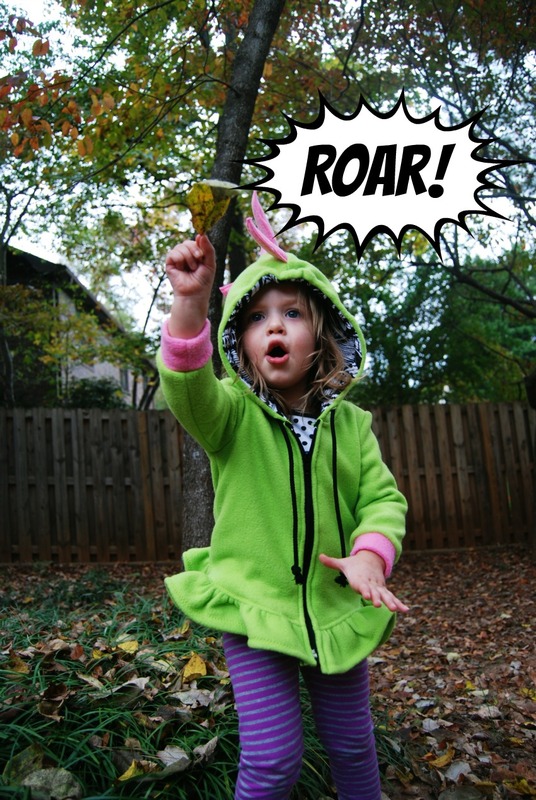 She lunged for me and let out the most ferocious roar I've ever heard! It was terrifying. Just when I thought I had met my demise, she turned. 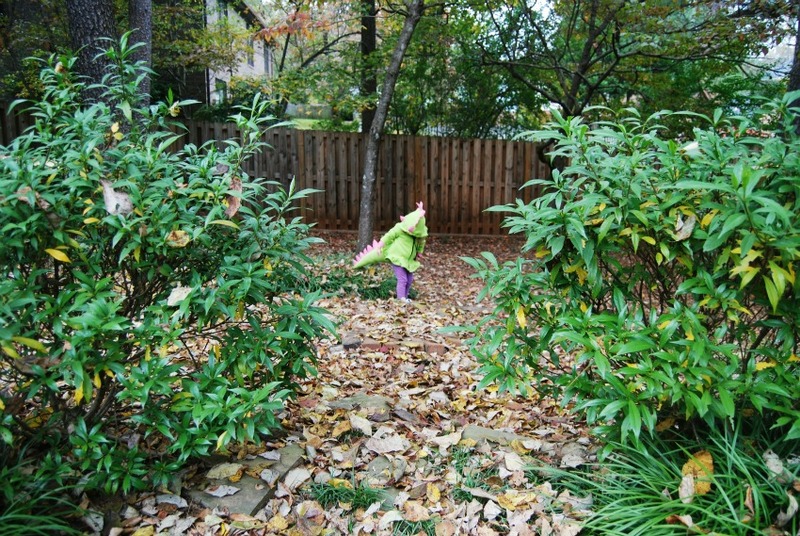 She ran back in to the foliage. It seems she was just as scared of me as I was of her. 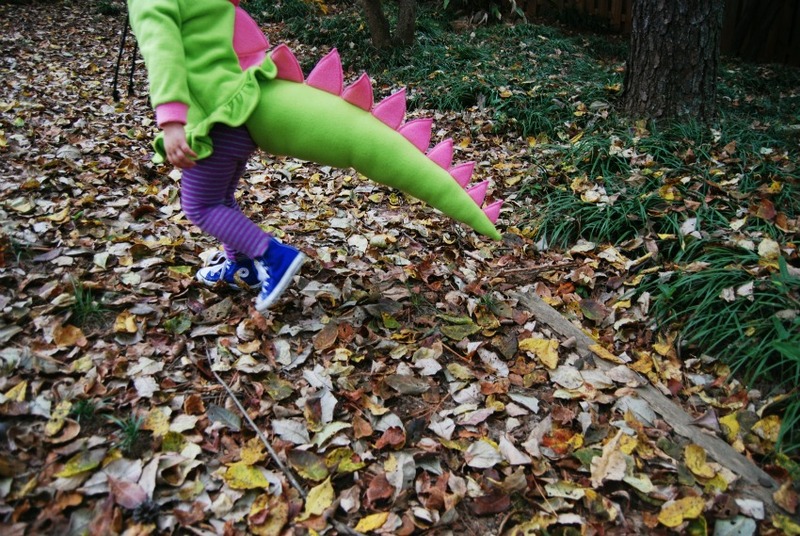 My later research has revealed that the enigmatic Toddlersaurus Rex is not a meat eater, lucky for me and that fateful encounter. They seem to prefer things like cookies and apple juice. And bananas and croissants, too. I really had a ball making this costume, if you can't already tell. Especially this year since this was completely at Jane's request. I asked her what she wanted to be for Halloween. Her first response was, "cow" followed by "dinosaur." And then dinosaur it was. She has talked about this costume for well over a month. And sorry for the picture overload. We had fun taking pictures. There were too many to choose from. It's really an unoriginal costume. I got the idea straight from the internet. 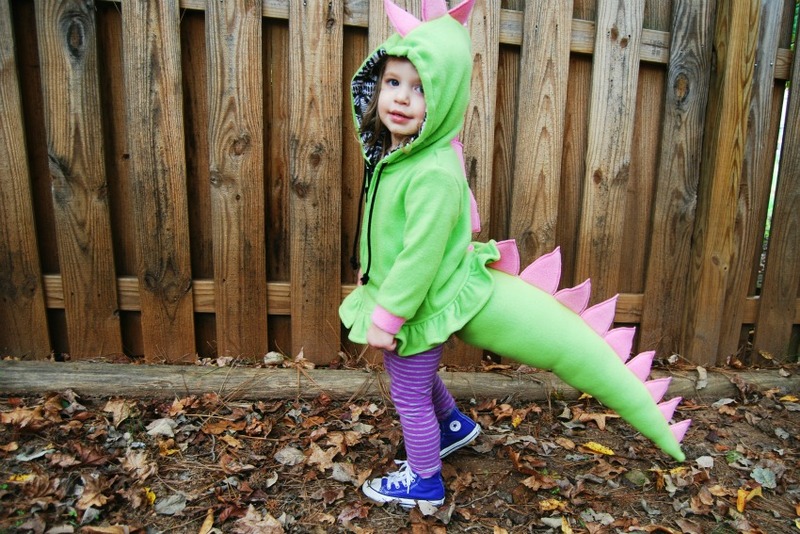 Actually, I first saw the dinosaur tails on House of Lane and mentally filed it away for my dinosaur loving girl. 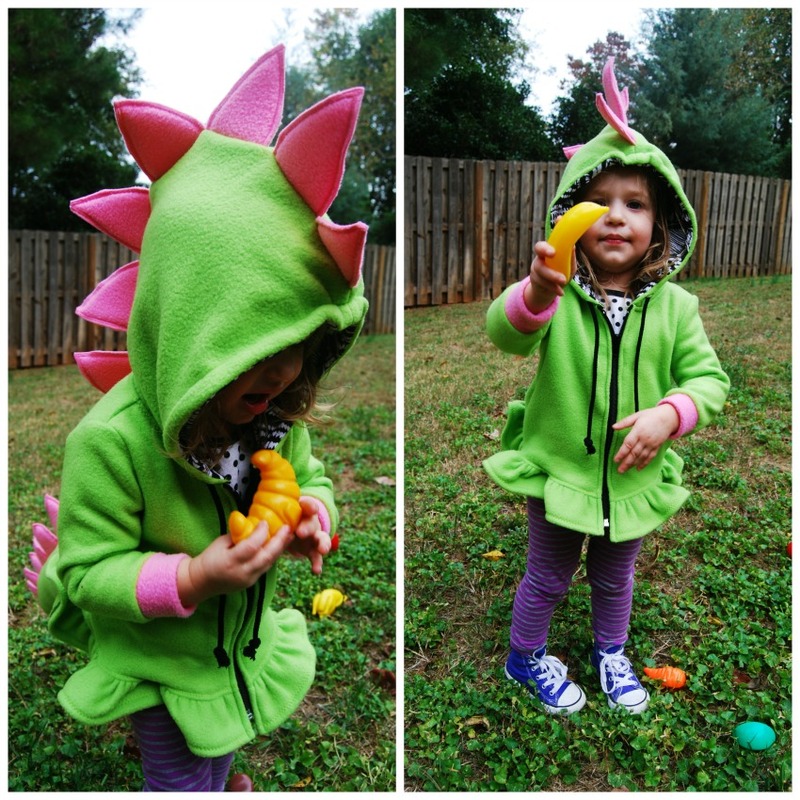 So when she requested a dinosaur, I looked up those dinosaur tails and found umpteen etsy shops that sell them along with dinosaur hoodies. But of course, I am a die hard DIY-er. 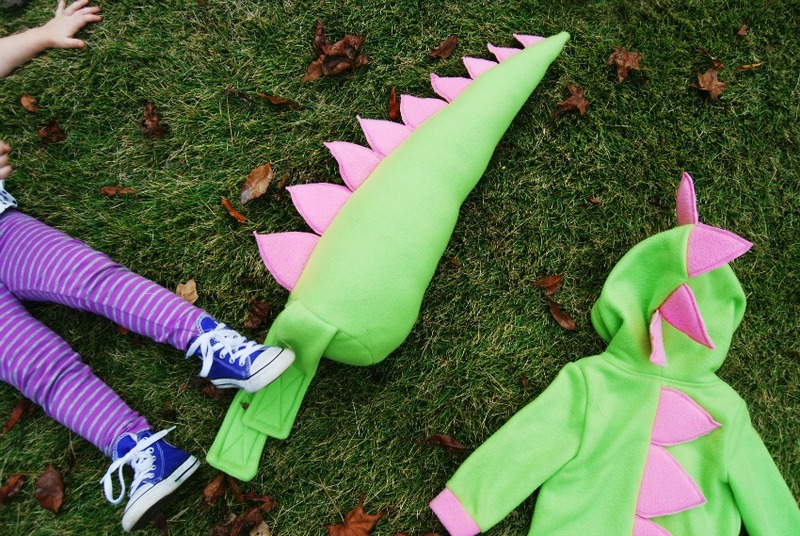 And a handmade Halloween costume is going to be my tradition. So I made it. I used McCalls 6782 for the hoodie. 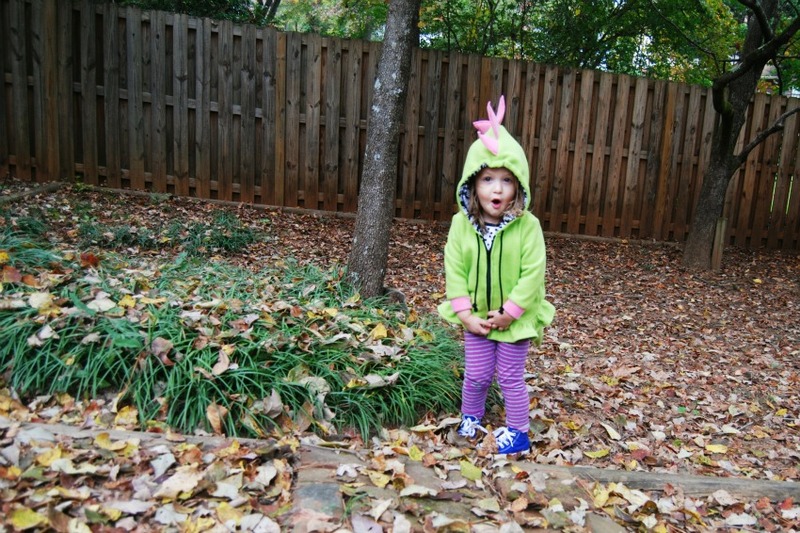 My original plan was to use real apparel fabrics (nice sweatshirt fleece) and make this something a little more sophisticated that she could actually use after Halloween. But after ordering two lengths that didn't work (bad color and really thin) I gave up and went to Joann's to buy the cheapest fleece I could get my hands on. My toddler came with me and picked the colors. She was very specific! 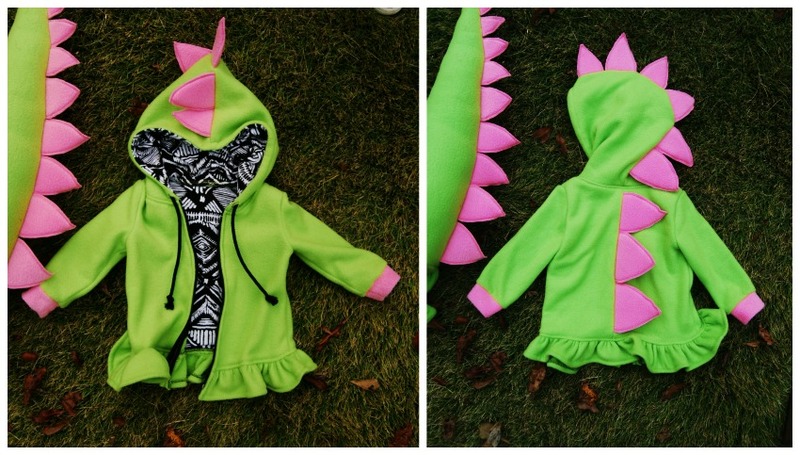 And there's not a whole lot you can do to make lime green and hot pink fleece look polished. The McCalls pattern is a good one. I chose it because it was on sale. But I was impressed with the fit. This is a size 2 and it is spot on my two year old. Usually I find Big 4 kids patterns to be huge. I cut the back piece down the middle to add the dinosaur spikes. 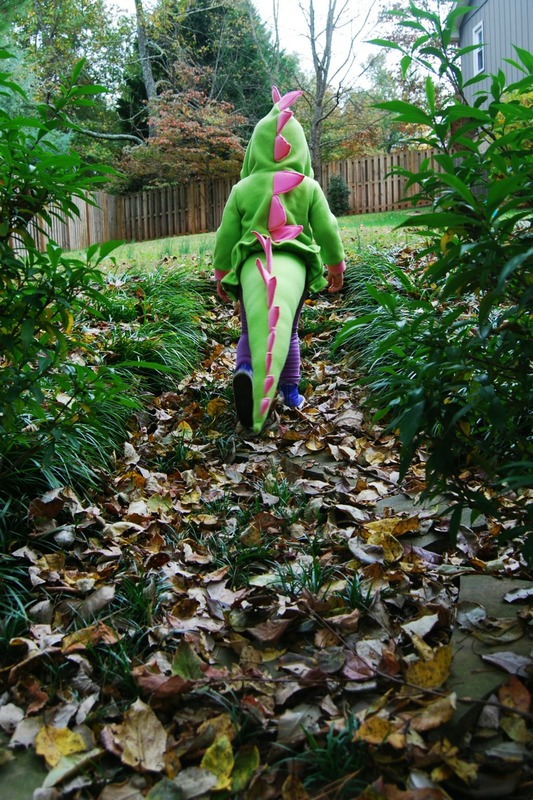 And then I lined the hood and back to cover up the ugly seam that sewing the spikes made. 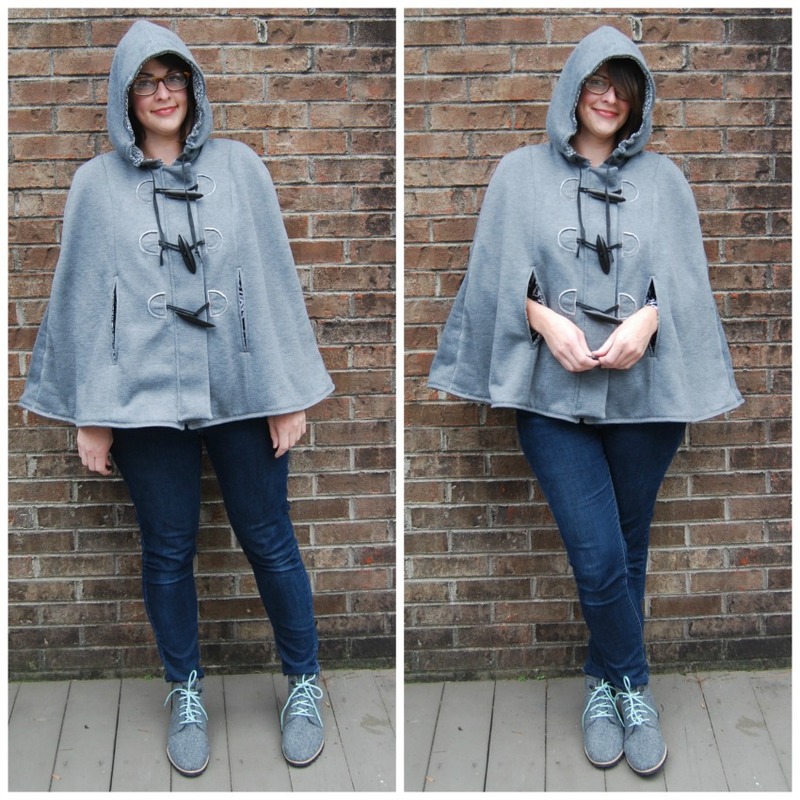 Actually, I planned on lining the hood all along to add a drawstring just like the poncho I recently made. I used a Pellon product called Flex-Foam for the spikes instead of stuffing them. This stuff is really cool. I kind of want to make myself a bag with it. Great structure but it's soft and squishy. The tail was just free handed. It's about 20 inches long. I traced a salad plate for the circle that sits against her bottom. The straps are 4 inches wide and 10 inches long. For a child any bigger, they would need to be longer. I placed the straps slightly higher up so the tail would sit right. The tail is so adorable, I almost can't stand it. It will make a great play item long after Halloween is over. She loves it. I sewed it all it one day, too, if you can believe it. I sewed like a maniac and am so glad I finished it. Anybody else sewing costumes? I've been kind of m.i.a. in the blog world lately. And no, I'm not apologizing for that, but I miss it! I'm going to have to spend some time with my blogroll soon. I've been swamped at work and my free time is nil right now. 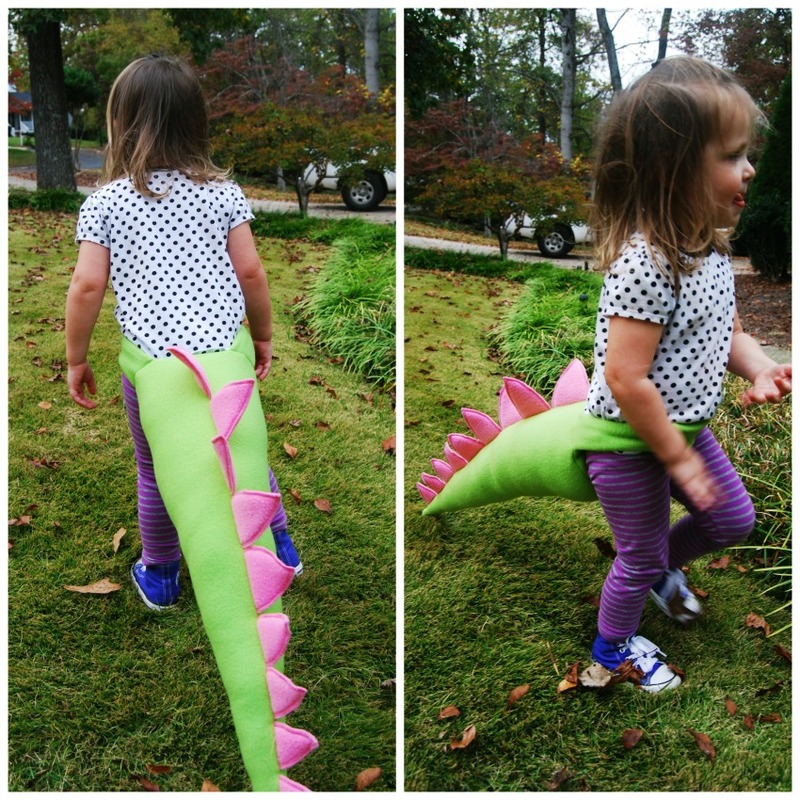 I'm kind of proud of myself for sewing this costume (and blogging it!) this weekend. I have a huge art show at the beginning of December, a really formal one. I'm very excited about it but it is eating up all my time. I'll be thrilled when it's over. I'll catch up one day! If I can make it to Thanksgiving when all the art is due, I'll be good. Y'all. My child. Look at her. She is figuring it all out. Soaking it all up like a little sponge, making her own decisions and forming her own opinions. I can't tell you how many times a day I hear, "No, I do it!" It honestly is pretty awesome to watch most of the time. However, not so much when this happens. 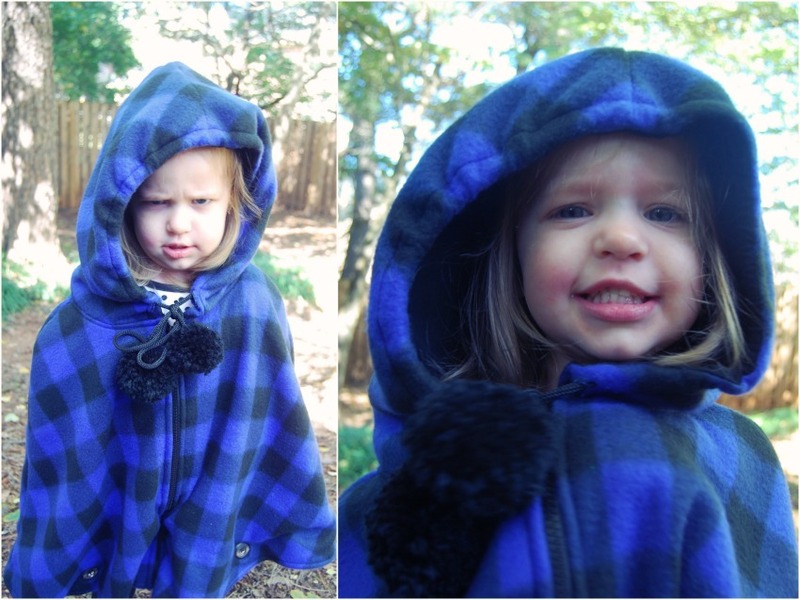 I made this really cute poncho using McCalls 6431 in a blue check fleece. It's adorable. I even made pom poms for the drawstring. That's right, pom poms that I made. I'm not sure why it's such a dud with her. It's soft. It has a hood. Her response to it: "I no like it" and total refusal to wear it. That was before even trying it on. I took these photos the other day under heavy, heavy coercion. And bribery with a tootsie roll pop. The photos are hilarious. I have snorted quite a few times while editing. To be fair, the poncho is way big. I think the main issue is that she doesn't know what to do with her arms, much like myself when I'm wearing my cape I made. It's kind of like a toddler straight jacket. If it was shorter so she could stick her arms out of the bottom (or if she was taller), it would work. 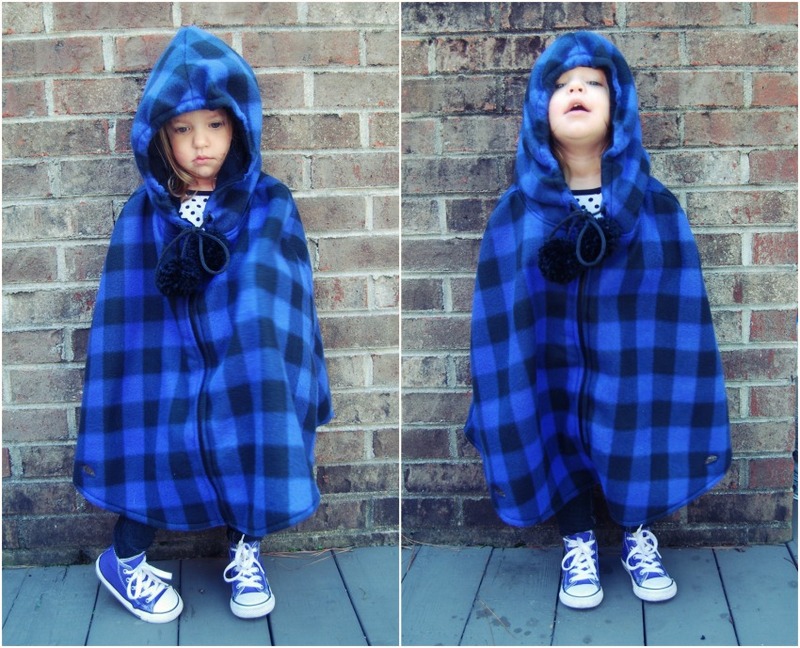 Or maybe a poncho is just not a good idea for a toddler. I made a size XS, which is listed as a 3-4. And it definitely is. She is wearing a 3T now in rtw, but just barely. So I will put it away in the closet until next year. Or possibly the year after when she's 4. Maybe she'll change her mind about it by then. 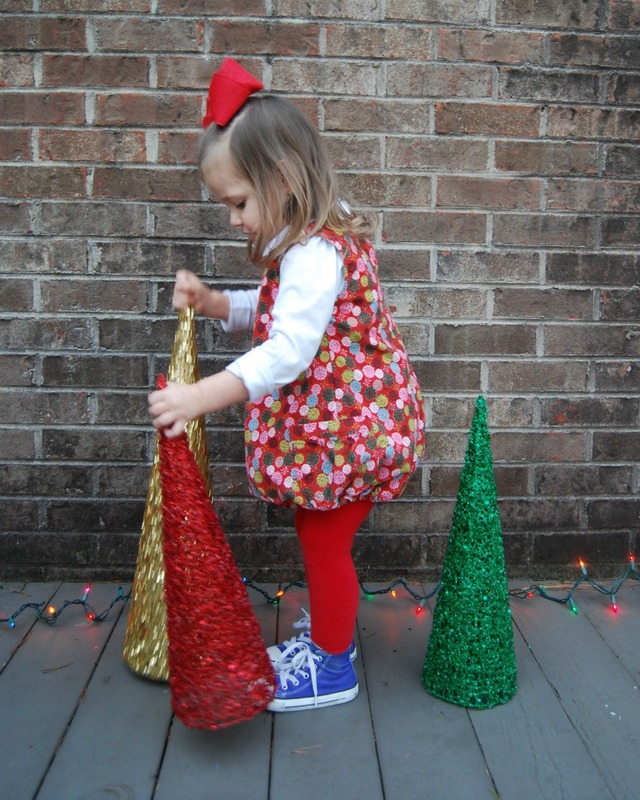 She does like the pom poms. The pattern is really simple. 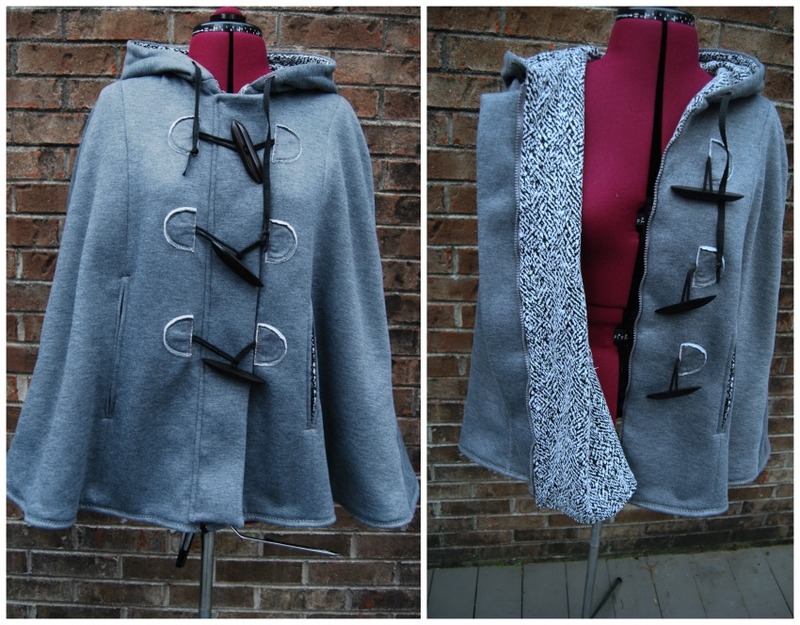 Three pieces- front, back and hood. I did deviate a little and line the hood so I could sew a casing for a drawstring. I used a scrap of bamboo knit for the lining. I knew it would be nice to be able to cinch the hood in. Also because I wanted to add pom poms all along. I made them with my pom pom maker and some really soft black yarn. Not sure how they'll do in the washing machine, so they are just tacked on to the end of the drawstring and can be removed really easily. I'll probably try washing them once just to see what happens. 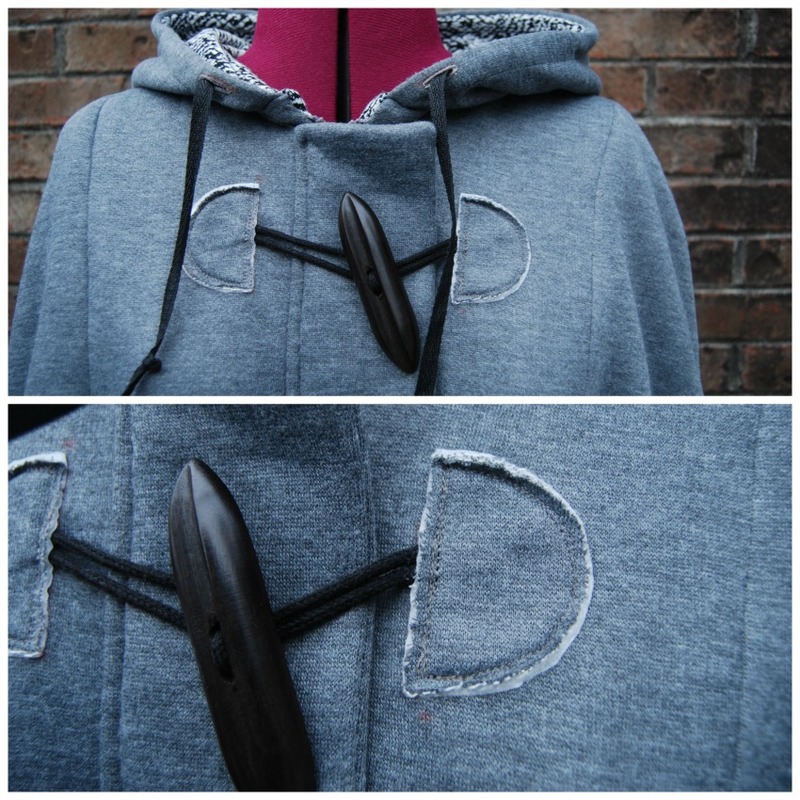 I added two button holes at the front of the hood where I sewed the casing for the drawstring. 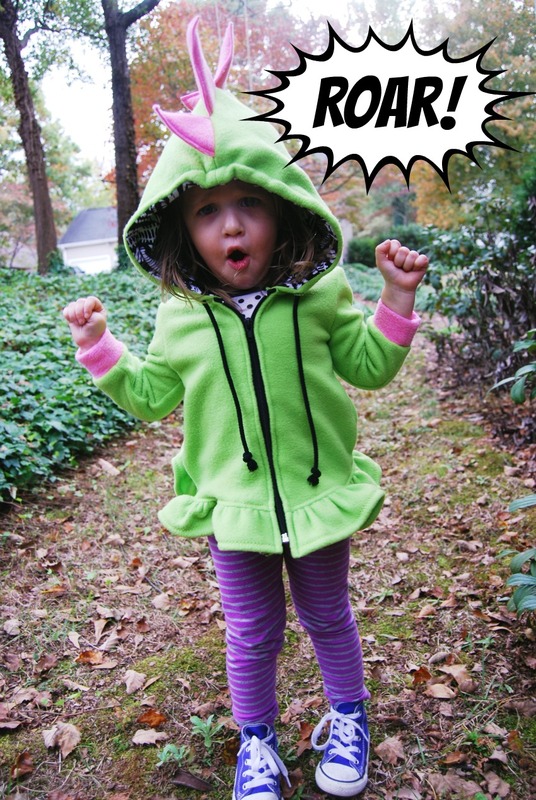 I did that before I sewed the lining to the hood. I also made the button holes at the bottom of the poncho per pattern instructions but they are pretty crappy in fleece. I should have stabilized them with something first. They flop open and slip off the buttons easily. I think I'm going to sew the button holes shut and sew snaps instead. I'll just sew one of the buttons on top to cover up the button hole. However, no rush since she's not likely to wear it any time soon. She is a trip. 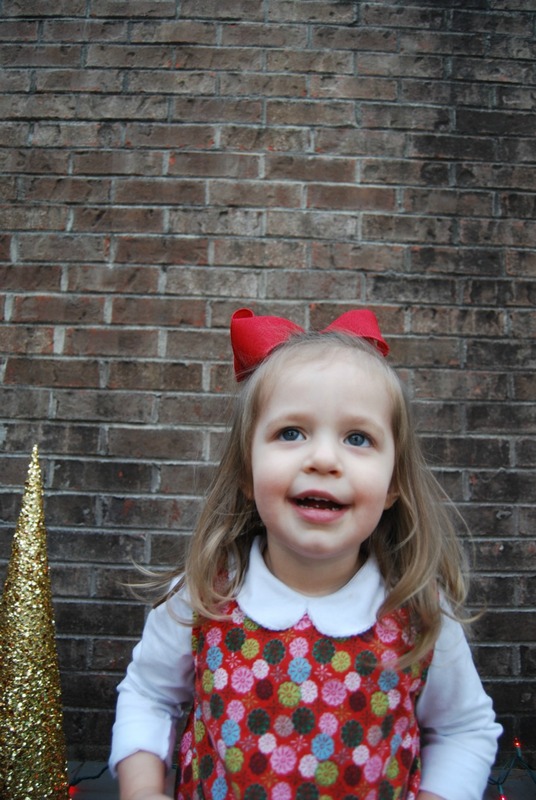 She's almost two and half and full of personality. This picture below is me threatening not to give her the tootsie roll pop unless she smiles. Cute little pattern. I recommend it. 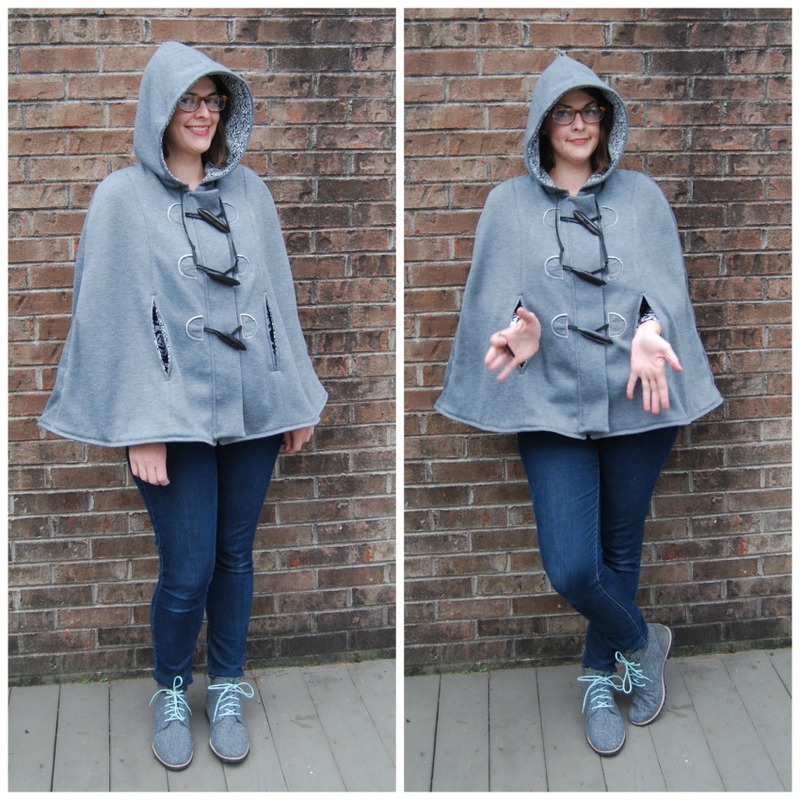 I actually am a little jealous of this poncho and would like something similar for myself. I've been plotting one, maybe in some grey sweatshirt fleece. Would that be ridiculous??? ...of McCalls 7115. What is it with me and making things in threes? It seems the last few projects have been done in threes. The second and third versions are always easier than the first. And I can apply some tweaks here and there. Anyway, I won't write a ton about these two pieces since I reviewed this same pattern here- my denim dress. 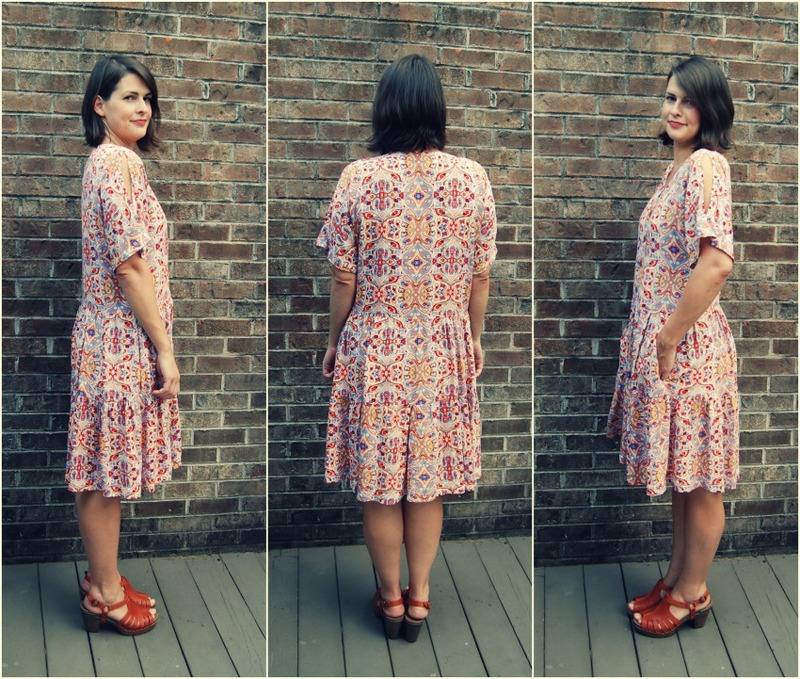 This is a simple, relaxed fitting pattern. Once I tweaked the shoulder seam, I didn't have to really fit anything else. There isn't any waist definition to this dress but for some reason it works. Maybe because there is a seam there? I love this version I made using a rayon poplin fabric. I also just made my black culottes in the same fabric. This was my first time using it, though. I would say it drapes just like a rayon challis but is heavier and more opaque. And there is almost a slight sheen to it. I ordered this from fabric.com on a whim and was pleasantly surprised by the weight of it. I don't need any sort of slip or anything under this dress. I made view B, with the tiered skirt and cold shoulder detail. Both of those design features get kind of lost in the psychedelic print. But I like both nonetheless. I did add an inch of length to both tiers. The bottom tier of the dress is actually three pieces instead of two. That wasn't apparent to me at first but I figured it out as I was sewing. So my print placement is all over the place. I also screwed up the print match at the front button placket a little. I didn't stay stitch the neckline (and I can't remember if that is in the instructions- if it isn't, be sure to do it!) and it stretched out some from handling while sewing. I had to shave a little off the front center to make the facing fit right and in the process messed up my perfectly matched print. It's close enough. I sewed the facing with a triple stitch again. And I added pockets again, too. This dress definitely needs pockets. I put a filter on these photos because the colors were so washed out for some reason. The light is changing. But this photo below of the shoulder splits doesn't have a filter on it and is a good representation of the colors in the fabric. I did notice on my denim version that something was up with the hem. There was a height difference in front even though I knew my hem was straight. I thought maybe it was just the dress pulling backwards or something. Valerie helped me figure it out and it makes perfect sense now. When I made that shoulder adjustment to straighten out the shoulder seam, I removed a wedge of fabric. I need to add that wedge back to keep the skirt from tilting up. However, by the time I talked to Valerie about it, I had already made this dress and cut out my blouse below. So both of these have that same tilt, though I think it's less apparent in fabrics with more drape. If I make this again, (a fourth time!) which I might, I'll fix it. I'll add that wedge back in to the center front to make the skirt hang evenly. 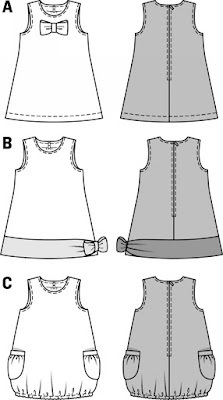 The blouse version is the same view, but just one tier instead of two. It's a new favorite. It's been worn to death since I made it. In fact, one of my students pointed out that I had worn the same top the week before when I wore it this past week. I see classes once a week, so they notice if you wear something twice in a row. 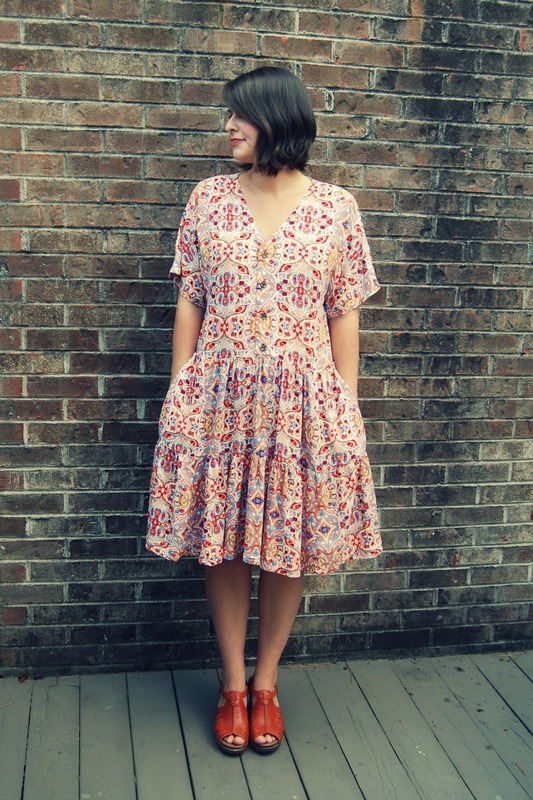 It's made in a rayon challis I found at Joann's that I love. I tried to just balance the print on the front since it's so patchwork-y and failed. Look at that yellow section that almost matches. It think it looks fine, though. Anyway, nice and easy pattern. I think I'm done with it for now that the weather is changing. But maybe I'll pull it out again next summer.